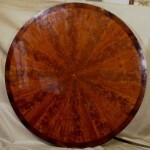 A beautiful Regency/William IV period tilt top “breakfast” table with pie sectioned book matched feather plume figured mahogany top and rosewood cross banded edge. 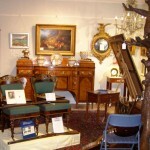 The four column and boxed pillar has four inset Gothic arched panels with gilt beaded molding. 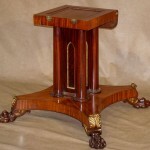 The square platform plinth with in-curving sides issues four carved mahogany paw feet with scrolled gilt leafage. I don’t know why they call these breakfast tables so you have my permission to call it anything your dear heart desires. 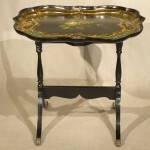 Whether it is a center table, library table, dinner table, supper table, etc. you get to choose. 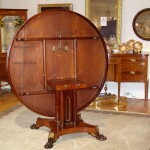 It does have castors for wheeling about though they are a bit worn and need special care in moving about a room. The top tips up and coupled with the wheels was meant to be a space saving attribute to facilitate placing in a corner or moving to the side wall of a room to make room for such things as dancing. 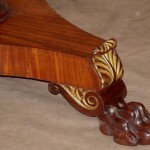 The top is held to the base with two large thumb screws which can be withdrawn so as to separate the top from the bottom for easier transport. Excellent. 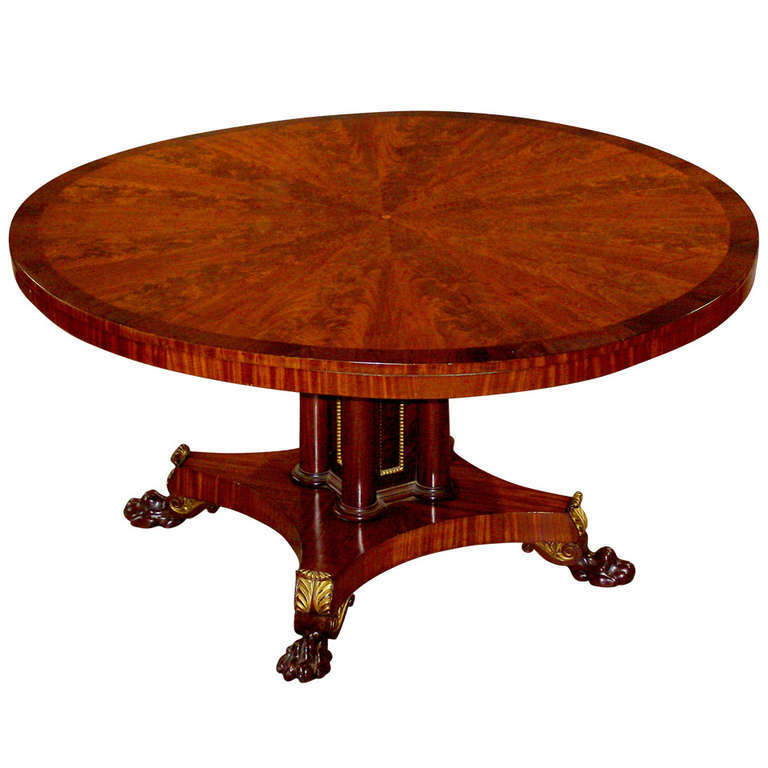 This is a wonderful nearly 200 year old table of superior craftsmanship and materials that has normal characteristics of age and usage. All repairs are stable. 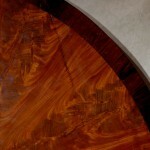 Typical of tables of this type there is shrinkage over the decades and the old glues tend to deteriorate. 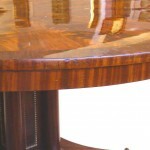 The table has also been used but remains in very good usable condition with a bright clean finish. There are blemishes and some warping and repairs. If you want perfect and untouched look elsewhere as I rarely see it. 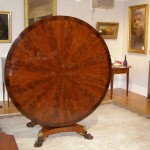 Diameter: 4 ft. 11 in.